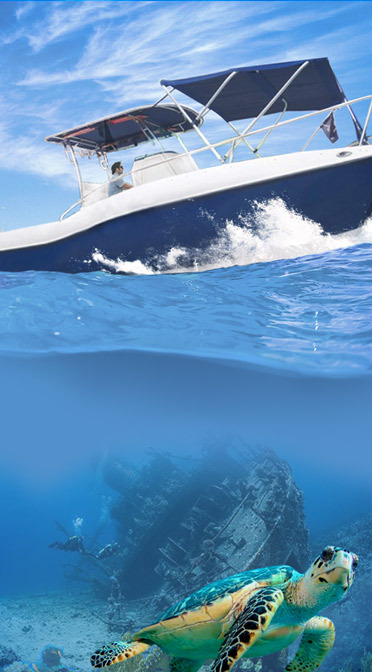 How about enjoying an incredible nautic experience and visit the Recife de Fora's Marine Park? Within a total preservation area of 17,5km2 and an extreme diversity of marine fauna and flora, visitors will be able to dive in those natural pools and get closer to fish's schoals, corals formations among other marine species. This experience is guided by a dive professional specialized who will give you all the environmental and technical information about the sighted species. Our boat takes all of Resort's comfort to the sea serving soft drinks, snacks, float and dive equipment besides all the security and care during the tour. And the best thing is that, you don´t need to go far for it! All tours starts on our Beach Club! More convenience for you to enjoy every minute in our paradise. The nautic experience of Recife de Fora's Marine Park has a limitation of 35 people per tour. The on board service includes snacks, fruits and non-alcoholic beverages. Dive equipments such as: Snorkel, dive suit and float will be provided free of charge during the tour. Have you booked already? Access the YAGO or go to the Guest Experience! !